Let Fury Have The Hour release date was Friday, December 14, 2012. This was a Limited in theaters release. Chronicles how a generation of artists, thinkers, and activists channeled their creativity into an organized response and resistance to the reactionary politics that increasingly defined American culture in the 1980s. 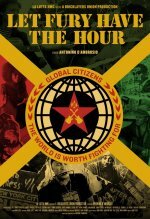 The film premiered at the Tribeca Film Festival earlier this year and brings together over 50 powerful, of-the-moment voices including street artist Shepard Fairey, comedian Lewis Black, musicians Tom Morello (Rage Against the Machine) and Chuck D (Public Enemy), and filmmaker John Sayles.